RICHTER'S ON MAUI... A206 AT NAPILI SHORES RESORT! Located directly on the ocean with 240 degree view of the water. There is no better location in all of Maui!! Complimentary High Speed WIFI in condo! Enjoy this spacious condominium, with lanai overlooking the ocean, on secluded Napili Bay. With its white sand beach and clear emerald waters, Napili is perfect for your honeymoon, anniversary, birthday or any special occasion! Tucked away between palm trees, crystal blue waters , and colorful hibiscus is this newly decorated oceanfront condo with everything you need to be happy while in 'PARADISE'. Just bring yourself and your loved one for the most romantic time of your life!! Enjoy breakfast and lunch at the famous 'Gazebo Restaurant' on the oceanfront at Napili Shores. You won't forget the Macadamia Nut Pancakes! Dinner is served just a short walk down the beach at the 'Seahouse Restaurant' on Napili Bay, where you can dine while watching the miracle of the Maui sunset. Happy Hour at the Seahouse is supurb! For a delicious Hawaiian Dinner, visit the 5315 Kitchen, a new restaurant located on the property at Napili Shores. In addition, water sports gear rental and sales are available at Water Works Sports at Napili Shores. Two full-size swimming pools are available on the beautifully landscaped tropical grounds and snorkeling is superb in Napili Bay. You will swim with the turtles, and schools of colorful tropical fish will eat from your hands. After snorkeling, enjoy grilling on the outdoor barbecues near the oceanfront or relax in the hot tub! Complimentary coffee is provided in the morning at the oceanfront pool. Spectacular Maui Sunsets every evening!! On Jan.2, 2019, Dave and Robin Casper purchased A206. They will be renting the condo on VRBO and HomeAway as we have done. Their website can be accessed at www.homeaway.com/1499487 or www.VRBO.com/1499487. Dave and Robin live on Maui. Their e-mail address is dcasper66@yahoo.com and they can be reached by phone at 530-941-1379. Newly remodeled bathroom with tiled shower and granite counter tops. Napili Bay - One of the best white sand beaches on Maui. Lahaina, Maui - beautiful oceanfront town with restaurants and gift shops, magical sunsets and lots of fun places to visit! West Maui Mountains frame the area on the East and Napili is situated on the ocean to the West. Napili Shores Resort is located on the ocean. A206 is an oceanfront condo directly on the water. Napili Shores Resort is managed by Outrigger Hotels. A206 is on the water at Napili Bay, Maui, Hawaii! Great ocean front location to view the Whales and Trutles that live in the beautiful warm waters of Maui! 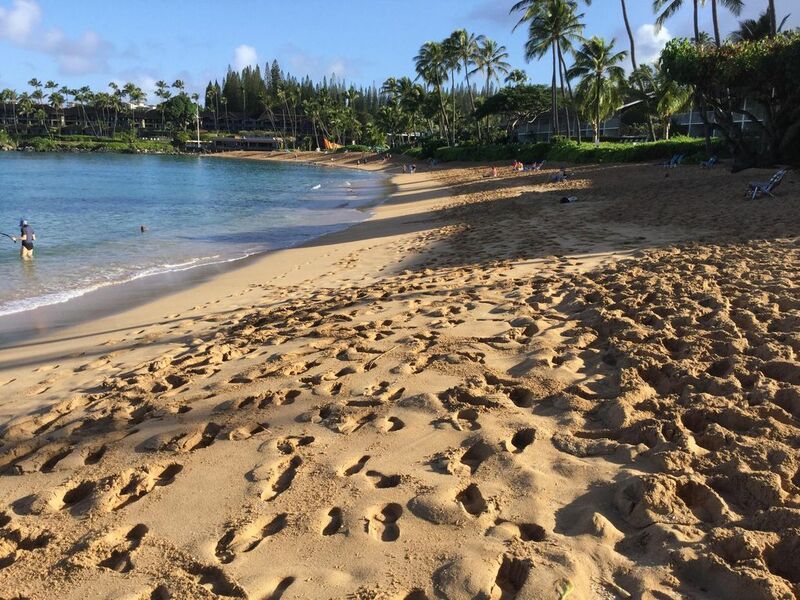 Napili Bay is one of Maui's best white sand beaches! Kapalua Golf Course within walking distance! West Maui Mountains to the East and the Ocean to the West! Condo is located directly on the beach with a terrific view of Napili Bay and the Island of Molokai. Plenty of Linens are provided. Free Parking at Napili Shores Resort. Parking is close to condo and easy to access. Complimentary WIFI - easy to access and excellent speed. Towels are provided in the unit. You will need to bring your own beach towels. Living room is newly remodeled and furnished with a tropical theme., overlooking the ocean , with mirrors that magnify the beauty of the beach. A206 has the best view of the bay at Napili Shores! Full size refrigerator with an ice maker. Full size oven with a glass top stove. Large new microwave that hangs on the wall to allow more counter space in the kitchen. Automatic toaster provided in the condo. All dishes and utensils are provided - A206 has a fully stocked kitchen, including wine glasses and opener for the celebratory bottle of wine! Enjoy your meals while watching the whales frolic! Newly remodeled kitchen with new appliances, cupboards, tile and granite everywhere! The kitchen is stocked with all utensils you need to cook just like you do at home. Cook with a view!! Stools at granite counter top for indoor dining. Table and 4 chairs on the lanai for outdoor dining over the ocean. Library in unit. Take a book or leave a good one! Boogie Boards, Beach Mats and Chairs, Umbrellas, Cooler, etc. Large Lawn and tropical gardens, beautifully maintained by the gardeners at Napili Shores Resort. Flowers EVERYWHERE! Balcony overlooking the water. Table and 4 chairs for outdoor dining with an ocean view! Beautiful private deck overlooking the ocean. With a patio table and four chairs, meals are a real EVENT! Napili Bay is one of Hawaii's best beaches - beautiful white sand! Oceanfront: Condo is located directly on the beach with a terrific view of Napili Bay and across the ocean to Molokai. Phone with voice mail service and free local calls, Free Wireless Internet, 2 Pools, Hot Tub or Jacuzzi, Private Oceanfront lanai, Toaster, Coffee Pot, Electric Cook Stove, Ceiling Fan, All Linens Provided, Hair Dryer, Iron and Ironing Board, Gas BBQ, Three Restaurants on the Bay, Activity desk, Convenience stores, Complimentary morning coffee! We have always stayed at Napili Shores when visiting Maui but this was our first time staying at this unit. This was definitely a good choice. The view from the lanai was incredible and the condo was lovely. The unit has recently been renovated and has all new appliances. The kitchen was well stocked with anything you could possibly need to cook with. The owners were very attentive and made sure that you could easily contact them if you needed anything. Overall experience was wonderful. Gorgeous and comfortable bed and kitchen with new appliances and fan, but who would notice anything else but the view? Very responsive and accommodating owners. So great to meet Robin and David! Many thanks for your beautiful welcome. We will be back to A206 for sure!!! Unit is a dream - woke up to stare at the ocean and beach. Great views, comfortable accommodations plus extras including beach chairs, binoculars, small ice chest and boogie boards for use. The kitchen has everything needed to make meals, and the unit is decorated nicely and a breeze for "check-in." Highly recommend, can't wait to come back and stay again. Thank you for your feedback. You were a delight to have as a guest. Please come back again! We loved the variety for viewing from the lanai. We spent hours on the lanai, relaxing, people watching, being drenched with God's beauty. Very comfortable room space with the bed folded up. Would have liked a source of continuous Hawaiian music, and more amenities in the kitchen, like coffee filters. We might be getting too old for this, but we'd love to be able to return!!!! So glad you enjoyed yourselves in A206! - There is a constant stream of smokers who like to hang out right in front of this unit by the water. We were here for 2 weeks and there was never a day that was smoker free, so it's not a one time experience. We could smell smoke in the unit at least once an hour. We HATE cigarette smoke! - The unit is incredibly hot! Don't let the claims of the "trade winds" fool you. We were miserable for most of the 2 weeks, to the point that we seriously considered either shortening our trip or renting a second unit with AC (I actually inquired with 2 places but they were not willing to lower their rates, even on short notice when the unit would otherwise sit vacant). The ceiling fan at it's highest setting is slow and ineffectual. We tried to get a fan from the front office, but they advised they don't provide anything for this unit. We tried calling the owner, and in her defense she did call back, but it was 2 days later and we had already gone out and bought a fan. That helped a little, but even with the trade winds blowing for 2 of our 14 days, the unit is situated in such a way that the wind doesn't blow directly through. On those 2 windy days, taking a simple step out the front door made about a 10 degree cooling difference from the temp in the room. It would have been nice if the door had ventilation like the Napili Surf complex next door. There are very small windows above the door, but they didn't do much when open. We were not comfortable leaving the door open all night. - There is no ventilation fan in the bathroom, so the minute we got out of a cold shower, we were already hot again. The bathroom is like an oven 24/7. - The refrigerator has a poor seal so all the items tend to sweat and not reach the set temperature. This item needs replacing. I will say the unit was quiet, had a comfortable bed, and the incredible view and proximity to the beach. It was also well equipped with kitchen items. A portable AC unit and new refrigerator would be a huge improvement, but I'm not sure what you can do about the smokers since they seemed to be on public property while they consumed their cancer sticks. Thank you for your input. That being said, we are shocked. We have over 50 reviews from our valued guests. There has never been a two star review for A206! We are also shocked about the smoke you smelled outside the building. In 30 years there has not been a smoking complaint nor have we ever experienced smoke in the unit. You should have called the front desk with your complaint. They would have come down to talk to the guilty party. Napili Shores is a non smoking resort, but security cannot correct a problem they don't know about. In your final paperwork, you were given a number to call if there was a problem in the condo. If the refrigerator needed attention, our cleaning company would have sent a repairman immediately. Again, if nobody knows about a problem, it cannot be fixed! Lastly, this is the first complaint we have had about heat in the condo. The doors and windows all open and there is a ceiling fan with 10 speeds that works perfectly. I just checked with the current guests and all is well with the fan and heat. The condo is on the ocean and does not get direct sun. Our maid service would have been happy to bring out a fan if you had called them. It is hard to find fault with the ocean making too much noise, but everyone has their own preferences.